For just $99 + Delaware filing fees, you can incorporate your Delaware C Corporation with Shoobx. And that’s not all—you’ll also get Registered Agent service and access to all Shoobx workflows for a year to get your company started on the right foot. Our computers automate what most people do by hand. This means we can do a lot more at a much lower cost. You get the benefits. Incorporation is just $99 + Delaware fees. Incorporating companies is just a very small part of what we do here at Shoobx. With our platform you can hire employees, create stock incentive plans, raise money, view your capitalization table and a lot more. When you incorporate with Shoobx you get Registered Agent Service and access to all of our features for a year, after which regular subscription pricing kicks in. View our pricing. At Shoobx we take security very seriously. We are ISO 27001 certified and you can rest assured your information is safe with us. We also automate what many companies still do by hand, because of this we can process your filing in 24-48 hours. Welcome to the 21st century. Shoobx will walk you through our fast and secure incorporation process. Once you’ve finished entering all of your information Shoobx will take care of the rest and submit your information to Delaware. Shoobx will guide you through post-incorporation process with a workflow to walk you through the steps. Post-incorporation includes organizing your board, selecting company officers, setting up founders equity, and getting your EIN number. 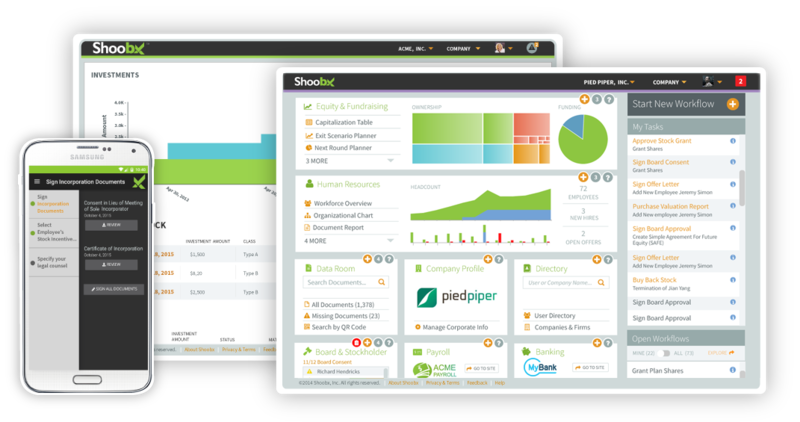 Shoobx can help you hire employees, create a stock incentive plan, perform a financing round, and much more. Learn more about our product. Shoobx manages all aspects of the employee lifecycle, from onboarding to job changes to offboarding. Our suite of HR features also includes comprehensive reporting, org chart, payroll integration, and employee portals. Close a round of financing in days and spend a fraction of typical legal costs with Shoobx. Execute your SAFEs, convertible promissory notes, and equity financings with our automated workflows to get money in your pocket faster. Grant equity with ease through our automated workflows. Our dynamic stock ledger and capitalization table are always up-to-date. We generate e-certificates, and can handle multiple classes of stock, 409A valuations, and more. Board and stockholder approvals are integrated into every workflow. Efficiently request and track signatures through the platform. We’ll even handle your board meeting minutes and stockholder communications. At the end of any of our 50+ workflows, all of your final executed documents are automatically organized in your Shoobx data room. Access controls and audit tracking are built in. From lawyers reviewing documents to investors conducting diligence to board members signing consents, Shoobx makes it easy for third parties to work with you on our platform. How long does the filing with Delaware take? Typically you are official within three days of filing with Shoobx. Most companies receive their official documents within seven days of filing on Shoobx. Why does the total incorporation cost $400? While Shoobx only keeps $99, Delaware has fixed filing fees that must be paid. Included in these fees is your first year of registered agent services ($100) and access to all Shoobx workflows for your first year on the platform. Click on the “Get Started” button and we’ll walk you through everything else. The incorporation workflow takes about ten minutes. What entities can I incorporate with Shoobx? Currently Shoobx only supports Delaware C Corporations.